Jurassic Survival is a free-to-play sandbox survival MMORGP where you wake up and find yourself due to some unknown reason cast away on a mysterious island that is full of hungry dinosaurs. Your objective as you begin to die of hunger and cold is it to hunt, collect resources, craft things and build a shelter. You must decide as you try to stay alive on this hostile filled jungle that is filled with predators whether you want to team up with other player or just take everything they have. Whatever you decide, the most important thing is to survive. Note: French/Korean/Japanese/Spanish/German localizations are also being prepared for release. What is the T-Rex Nest Event? What is the Best T-Rex Nest Event Strategy? 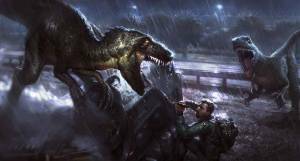 How do you Escape in the T-Rex Nest Event? What do you do with the T-Rex Nest Event Drops? How do you Build a Safe Shelter? How do you Build the Jeep? 28Urgent poll...Should I put Dan over my knee or not? 74Can You Guess My Name?